A small FYI for all you Pinners out there looking for more gift wrapping inspiration: I’ve started adding more gift wrapping boards to my collection. In addition to my general Gift Wrap and Packaging board, I’ve also created a pin board for Brown Paper Packages (there’s just so many great ideas for wrapping with kraft paper!) 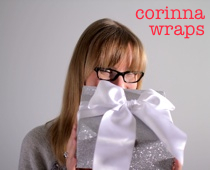 as well as one filled with ideas on how to wrap foods and drinks. Be sure to click over and follow me on Pinterest!